Registration for the 2019 Clayton Harvest Festival vendor fair is now open. The Clayton Harvest Festival's Vendor Fair will take place on Saturday, November 2, 2019 from 10:00am - 5:00pm on Main Street. The Latin American Festival Vendor Fair will take place on Sunday, November 3, 2019 from 12:00pm - 5:00pm in Town Square. Food vendors dates vary and are listed within the application form. Deadline for non-food vendor applications without late fees is September 13, 2019. A late fee of $50 will be added if you apply after this date. No non-food vendor applications will be accepted after October 1, 2019. Deadline for all food vendor applications is June 30, 2019. Deadline for Main Street businesses to apply for free booth/space is April 30, 2019. If you have a store/business on Main Street and wish to use your free 10x10 booth space on the street in front of your business or have us keep that space cleared during the Clayton Harvest Festival Vendor Fair on Saturday, you must apply as a vendor by April 30, 2019. If you do not wish to use your free 10x10 booth space on the street in front of your business as a booth or cleared space, this space will be sold and used during the vendor fair and you do not need to proceed with registering. Please be reminded you may not transfer your free space to another person/business to use during the Clayton Harvest Festival. If you are a CCOC Connector, Supporter, Foundation, or Blueprint level investor and wish to utilize your benefit of a free booth during the Clayton Harvest Festival Vendor Fair on Saturday, you must apply as a vendor, select your appropriate booth option, and use the promo code CAMPAIGN at payment. If you are a campaign investor and would like to serve food at your booth, please contact Maria Bunn at 919-553-6352 before proceeding. Please be reminded you may not transfer your free space to another person/business to use during the Clayton Harvest Festival. Both the Clayton Harvest Festival Vendor Fair and the Latin American Festival Vendor Fair allow up to two vendors from the same direct sales company to apply for a booth. However, some companies prohibit more than one representative per event. It is up to you to make sure the rules of the company you represent are being followed. We will try to post here if we have secured the festival limit; however, if you have a question, please contact us before you apply. ALL food vendors are required to submit a menu with their applications (use the product space to list all your items). If there are any menu conflicts, you will be notified. The Clayton Harvest Festival committee reserves the right to limit menu items provided by the vendor. This policy is in place to restrict food vendor competition. If you have a question, please contact us before you apply. Booth prices vary depending on your selection. Vendor booths start at $175 for CCOC investors (members) or $205 for the general public. Non-profit booths are discounted. If you are a non-profit, you must be able to provide proof (Form 990, etc.) if asked. Clayton Harvest Festival Vendor Fair premium booths have prime location and access to electricity (if needed). Regular booths do not have access to electricity. Make sure to choose your booth appropriately if you are registering for Saturday. All payment is due upon registration. If you wish to mail in a check instead of use a credit card online, please proceed with the online application, use the promo code CHECK at payment, and then mail your check to Clayton Chamber of Commerce, Attention: Maria Bunn, 301 E. Main Street, Clayton, NC 27520. If your check does not arrive within 7 days (or before the registration deadline if that comes first), your spot will be forfeited. If you are a CCOC Connector, Supporter, Foundation, or Blueprint level investor and wish to utilize your benefit of a free booth during the Clayton Harvest Festival Vendor Fair on Saturday, you can use the promo code CAMPAIGN at payment. The festival will be on the scheduled day regardless of the weather other than natural or unnatural disasters (hurricanes, floods, tornadoes, ice storms, terrorist attacks, war, etc.). 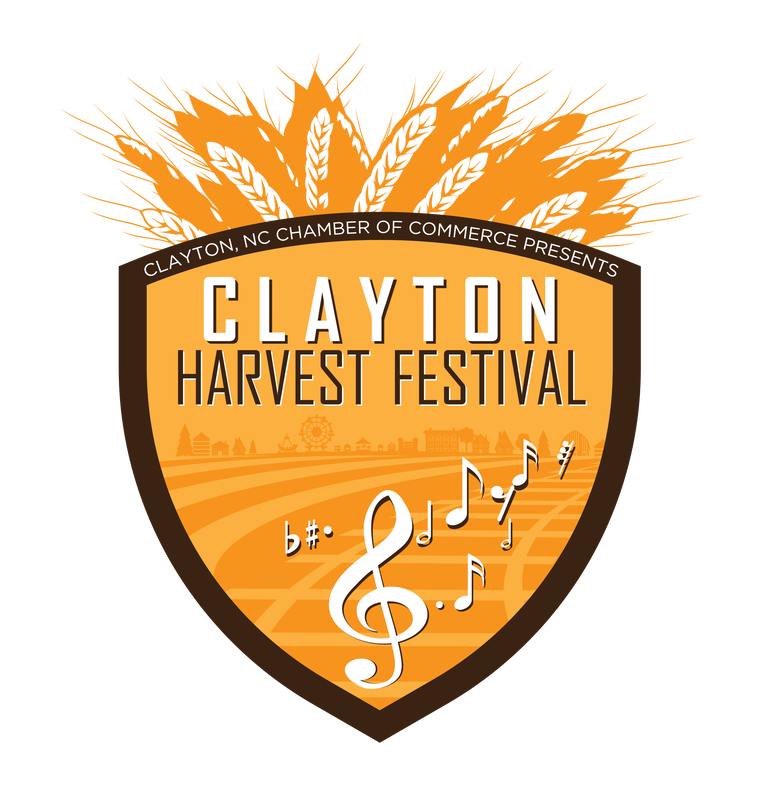 As the Clayton Harvest Festival is hosted by a non-profit organization with revenues being used to cover the event costs, fees are non-refundable. Due to Johnston County Dept. of Health regulations if you plan on selling ANY type of food at your booth, you are considered a food vendor and must select a food vendor booth and apply for necessary documents for Johnston County Health Dept. This includes any type food prepared at the festival, ice cream, snow-cones, smoothies, etc. If you come to the festival prepared to sell food, but have not selected food vendor, you will not be able to set up. Booth spaces are 10x10 (ft). Tents, tables or display shelving needs to fit within the allotted 10x10 space provided. Booths are assigned by the Clayton Harvest Festival committee. There is no guarantee of receiving a requested booth location. You must provide your tent and all things that will go in or around your tent, including tables and chairs if needed. Only those individuals who complete the applications and have fees paid in full will receive approval to display and sell. Anyone submitting an incomplete application or partial/no payment will forfeit their space. There are a limited number of booths and they will be assigned on a first-come basis. Once you have been registered you will receive your BOOTH ASSIGNMENT via email approximately two weeks prior to the festival. This will include your booth number as well as a vendor pass which will allow you to enter the festival area for setup. Two passes per vendor will be given. If more are needed you will need to contact us. Booths must remain in the assigned location until close of the Festival booth area at 5:00pm. Carnival rides and stage entertainment may continue after 5:00pm, but you must break down your booth at that time. Breakdown time will be between 5:00pm-6:00pm only. Town ordinance requires all vendors off Main Street by 6:00pm. These rules apply to EVERY vendor. The Saturday Vendor Fair during the 2019 Clayton Harvest Festival will operate from 10:00am – 5:00pm on Saturday, November 2, 2019. All vendors will be required to have their booths set up and ready for a 10:00am opening. All vendors will be required to be open during festival hours at their assigned locations. Vendors will not be allowed to close their booths prior to 5:00pm or stay open later than 5:00pm. The Sunday Vendor Fair during the 2019 Latin American Festival will operate from 12:00pm – 5:00pm on Sunday, November 3, 2019. All vendors will be required to be open during festival hours at their assigned locations. All vendors will be required to have their booths set up and ready for 12:00pm opening. Vendors will not be allowed to close their booths prior to the end of festival hours at their assigned locations. Once your application is received and approved, you will receive an email with complete instructions on arrival time and load-in within two weeks of the festival. Depending on your booth assignment number, you will be given a specific arrival time. Please adhere to these times. Included with your booth assignment notice will be your official vendor street pass along with a map to vendor parking. With this pass, you will be allowed to drive into the Festival area. MAKE SURE YOU BRING THIS STREET PASS WITH YOU TO THE FESTIVAL. Breakdown time will be between 5:00pm-6:00pm only. Town ordinance requires all vendors off Main Street by 6:00pm. These rules apply to EVERY vendor. Due to safety concerns Main Street will remain closed to vehicle access from 5:30am – 6:00pm (Saturday) and 8:00am – 6:00pm (Sunday). Exhibitors are responsible for unloading and disassembling their own booths in the designated area during their assigned time. Other streets may be blocked (and will listed in your arrival instructions prior to the festival). SET UP MUST BE COMPLETED, AND ALL VEHICLES MOVED OUT OF THE FESTIVAL AREA BY 9:15AM ON SATURDAY MORNING AND 11:00AM ON SUNDAY MORNING. As a vendor, you are responsible for cleaning up after yourself and throwing away your own trash. Please prepare accordingly. If any “trace” is found (i.e. trash, paper, stickers, goodie bags, etc.) from a vendor booth after the festival, that vendor will be unable to participate in future festivals. Electricity is available for premium booths only for an extra fee of $30.00. These will be assigned on a first-come basis. Clayton Harvest Festival Vendor Fair premium booths have prime location and access to electricity (if needed). Regular booths do not have access to electricity. Make sure to choose your booth appropriately if you are registering for Saturday. These are 120V only, and we have a limited number of plugs. Please note that once the available plugs are used, we will not have additional power. If you do have power, please be sure that all electrical cords are heavy duty and can be used outdoors. If you do not have the proper equipment needed to plug in to our outlets, you will not be able to use our electricity. We will not be providing an alternate plug for you. You will also need to have a cord cover (i.e. rubber mat, appropriate tape, etc.) to put over your cord to avoid anyone tripping. Power will not be available on festival morning to ANY vendor that has not applied and paid for power in advance with their application. ALL food vendors are required to submit a menu with their applications (use the product space to list all your items). If there are any menu conflicts, you will be notified. The Clayton Harvest Festival committee reserves the right to limit menu items provided by the vendor. This policy is in place to restrict food vendor competition. Only those vendors who select food vendor on their application and have fees paid in full will receive approval to participate in the festival. There are a limited number of food vendor spaces and they will be assigned on a first-come basis. Approximately two weeks prior to the festival, you will receive your location as well as what time you will need to arrive for load-in. Once you receive this information please contact us if you have any questions. You will be responsible for sending any necessary documents to the Johnston County Health Department. Typical food booth spaces within the Vendor Fair are 10X10 (ft). Should you require any additional space beyond your booth space, please contact us immediately. Food vendor space is limited and will be assigned as applications are received. All food vendors will be required to be open during festival hours at their assigned locations. Food vendors will not be allowed to close their booths prior to the end of festival hours at their assigned locations. This rule applies to every food vendor. Ice will not be provided to food vendors and waste water needs to be self contained. We do not provide pump out station or hook-ups to sewer for waste water. You can contact Maria Bunn at the Clayton Chamber of Commerce by emailing maria@claytonchamber.com or calling 919-553-6352 if you have any questions about being a food vendor. Festival safety is critical to all of us! It is important that we all work together to have a SAFE and fun Clayton Harvest Festival. All vendors are expected to conduct themselves in a professional and courteous manner when interacting with festival goers, fellow vendors, and festival organizers. Vendors failing to follow this rule will be asked to shut down booth operations and will be escorted out of the festival area. We only accept two booths representing each multi-level marketing company per vendor fair. However, some companies prohibit more than one representative per event. It is up to you to make sure the rules of the company you represent are being followed. MLM booths are approved on a first-come-first-served basis and include Avon, LuLaRoe, Rodan + Fields, Young Living, Mary Kay, etc. Contact the Clayton Chamber of Commerce at 919-553-6352 before you apply if you have any questions. The Clayton Chamber of Commerce, the Clayton Harvest Festival Committee, the Squealin' on the Square Task Force, the Latin American Festival Task Force, the Town of Clayton, and any official volunteer for the Clayton Harvest Festival are not liable for damages, injury or loss to any person or goods from any cause whatsoever. The Clayton Chamber of Commerce, the Clayton Harvest Festival Committee, the Squealin' on the Square Task Force, the Latin American Festival Task Force, the Town of Clayton, and any official volunteer for the Clayton Harvest Festival cannot be held responsible for any claims of damage, injury or loss arising out of or in connection with use of space or grounds in the festival. The Clayton Chamber of Commerce, the Clayton Harvest Festival Committee, and the Latin American Festival Task Force reserve the right to approve all products and materials and will limit the number of types of vendor offerings at the festival. All decisions will be final.